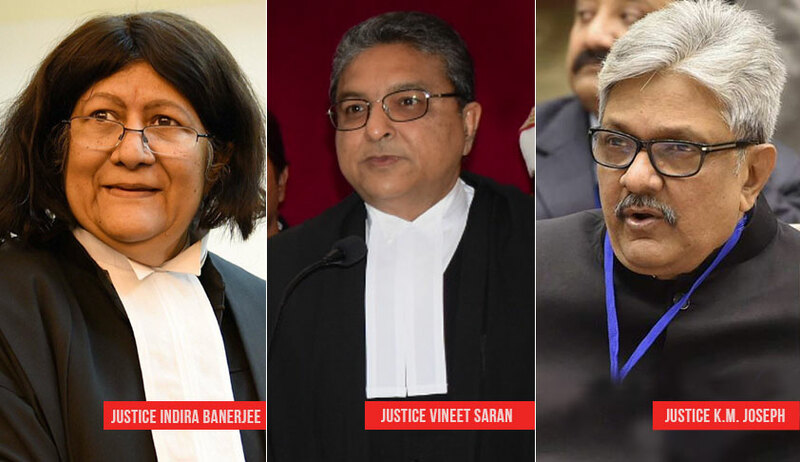 Three new judges— Justice Indira Banerjee, Justice Vineet Saran and Justice KM Joseph were sworn in today at 10:30 am in the Chief Justice’s Court, raising the total number of judges to 25, as against the sanctioned strength of 31 judges. Justice Saran enrolled as an Advocate with the U.P. Bar Council in July, 1980, and practiced in the Allahabad High Court till February, 2002, when he was elevated as a Permanent Judge of the High Court. He was transferred to Karnataka High Court in February, 2015, and was sworn in as the Chief Justice of Orissa High Court in February, 2016. Justice Joseph enrolled as an Advocate in January, 1982, and was appointed as a Permanent Judge of the Kerala High Court in October, 2004. He was then transferred to the Uttarakhand High Court and assumed charge as the Chief Justice in July, 2014. As the Chief Justice, he pronounced a judgment quashing the President’s rule imposed in the State of Uttarakhand, and thus began a long wait for a transfer or an elevation. The Collegium had, in May, 2016, recommended his transfer from Uttarakhand High Court to the High Court of Andhra Pradesh & Telangana. However, there was no action on this recommendation. His name was finally reiterated on July 16, along with Justice Banerjee and Justice Saran. The appointment notification however placed him after the two judges, making him junior to them. This had given rise to a seniority fiasco, with several senior Supreme Court judges meeting the CJI to discuss the issue. The judges essentially asserted that since Justice Joseph was the first to be recommended by the Supreme Court collegium, his name should have been first in the appointment notification. In order to restore his seniority, they had requested the CJI to administer the oath to him first. The CJI had then agreed to discuss the matter with Attorney General of India K.K Venugopal.